The Pakistan government today named two terrorist organisations, Lashkar-e-Toiba (LeT) and Jaish-e-Muhammad (JeM), working in Jammu and Kashmir, as banned outfits among 59 other organisations. However, Mumbai attack mastermind Hafiz Saeed-led Jamaat-ud-Dawah is not among the list of 61 banned outfits but is “under observation”, the country’s Interior Ministry told Parliament today. State Minister for Interior Balighur Rehman presented a list of 61 banned militant, sectarian and extremist outfits in the country before the Senate, the Upper House. “Jamaat-ud-Dawah (JuD) is not included in the list of banned groups as it is under observation,” he said. The list of banned organisations includes groups like the Islamic State, Lashkar-e-Jhangvi, Sipah-e-Muhammed Pakistan and Sipah-e-Sahaba. It also includes Baloch separatist groups like Balochistan Republican Army and Lashkar Balochistan. The minister said the banned organisations are watched to prevent them from resurfacing under different names and the provinces have been asked not to allow banned outfits to come up. Both LeT and JeM are active in Jammu and Kashmir for past many years and despite facing ban for doing activities in Pakistan, these terrorist organisations are working in J&K. Both these organisations have been involved in terror activities in J&K and rest of India like 26/11 Mumbai attack, which was carried by LeT and they continue to get support from across the border. India has been continuously pushing for action against these banned groups who are using Pakistan’s territory to attack India. 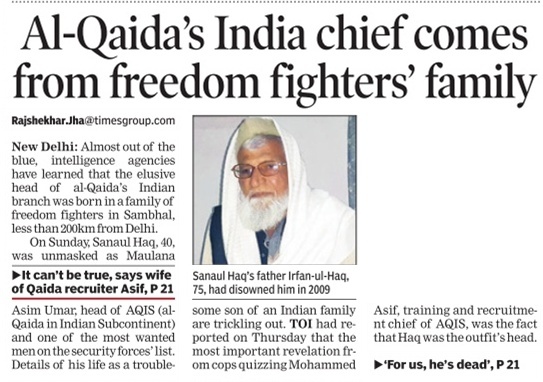 Many a times, India has given proof of camps being run by these organisations in PoK and are sending terrorists inside India, but no action has been taken so far. Chief Minister Mufti Mohammad Sayeed today pitched for developing the Suchetgarh international border on the pattern of the Wagah border in Punjab so that people from both sides could meet at this point. 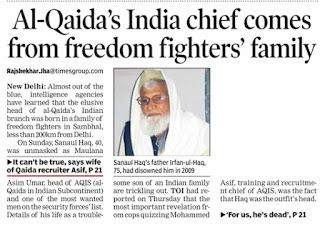 He promised to take up the issue with the Ministry of External Affairs. “This is the nearest place from Jammu on the Indian side and Sialkot from the Pakistan side. If developed like the Wagah border, it could attract tourists from all over. Already Rs 7 crore were allotted for developing the area but that is not enough and we need more money,” Mufti said while talking to reporters on the Suchetgarh border, 30 km from here. The Chief Minister was on tour to the border areas today and had a discussion with locals on development in the area. He said people of Jammu had complaints that the tourist footfall had come down in the Jammu after the train service had reached Katra. “If we need to acquire some land to develop this place, we will do that. This is one place in Jammu which can be developed as a tourist destination,” Mufti said. “On the other side it is Sialkot and here it is Jammu. Earlier, when I used to visit this place, people from the other side also used to visit this place. It is my desire to develop this place as a tourist destination on the pattern of the Wagah border in Punjab,” the Chief Minister said. He said the government would try to set up an amusement park near the international border in Suchetgarh. “We are trying our best to develop this place on the pattern of the Wagah border so that this place becomes a meeting point of the people from both sides,” he said. “I feel that this is the closest point between the two sides which can also help become a bridge between the industries on either side,” the Chief Minister said, adding that this place could act as a meeting point between people from both sides, especially schoolchildren. In the backdrop of delayed projects due to manpower shortage and inadequate budgetary support, the Defence Research and Development Organisation (DRDO) is creating 1,316 new scientific posts. This would be an increase of about 17% of its existing authorised scientific cadre strength. As desired by the Department of Expenditure in the Ministry of Finance, a revised Cabinet Note for augmentation of manpower of DRDO by 1,316 posts has been forwarded for consideration of the government, Parliament’s Standing Committee on Defence has stated in its latest action taken report. The additional intake would include 1,260 scientists and 56 works cadre officers. These posts will be filled in a phased manner spread over three recruitment years. New Delhi: The national auditor on Friday rapped the Defence Ministry over ageing assets, some over 40 years old, in the Army Aviation Corps and for failing to provide combat free-fall parachutes to the special forces for over a decade, among other things. The audit body also criticised the ministry over the shortage of 47 percent in the holding of BMP infantry combat vehicles in the Indian Army. 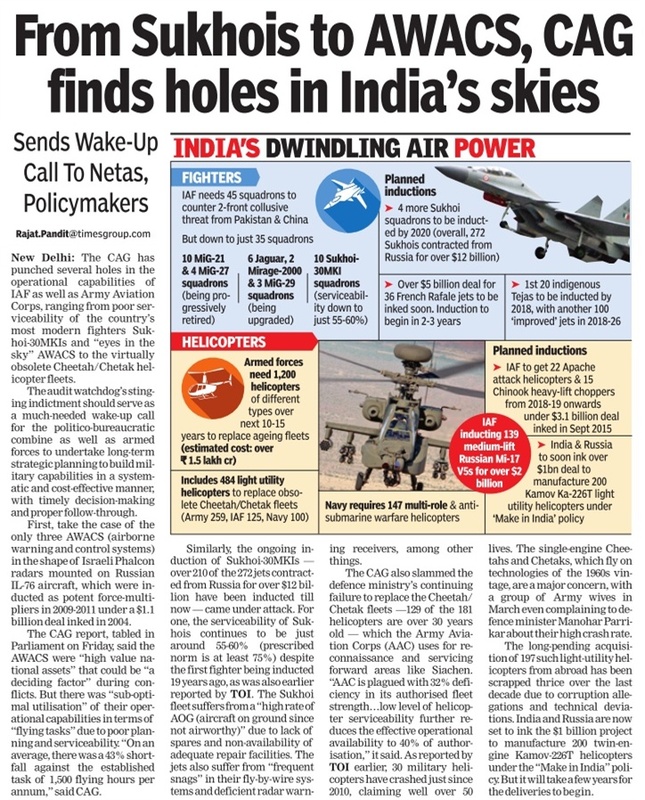 In its report submitted to Parliament, the Comptroller and Auditor General of India said that although the Army Aviation Corps was created with the main objective of contributing to battlefield success by providing guidance to field commanders in applying decisive combat powers, it is plagued with 32 percent deficiency vis-a-vis its authorised fleet strength. reduced to 40 percent of the authorisation due to low level of serviceability of the existing fleet," said the CAG report. 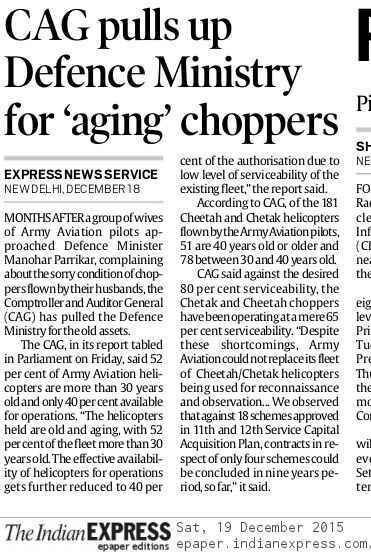 Of the 181 Cheetah/Chetak helicopters held by the Army, 51 were 40 years or older and 78 were between 30-40 years old. 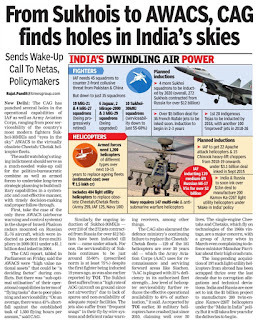 The CAG observed that ever since these were approved for de-induction (2002), 23 helicopters had met with accidents. Despite these shortcomings, Army Aviation Corps could not replace its fleet of reconnaissance and observation helicopters (Cheetah/Chetak), which are due for de-induction since 10th Plan period (2002-2007) onwards, it added. Against the 18 schemes related to acquisition of equipment, including helicopters, for the Army Aviation Corps, approved in the 11th and 12th Service Capital Acquisition Plan, contracts in respect of only four schemes could be concluded in the nine-year period so far. 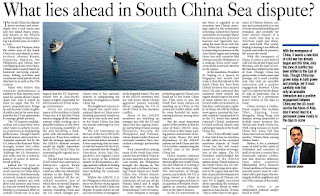 "Failure in meeting the targets and objectives of the acquisition plans and tardiness in procurement action were the main reasons denying the Corps to acquire suitable replacement for the old and ageing fleet (sic)," the report said. A group of Army officers' wives had in March this year urged Defence Minister Manohar Parrikar to stop the use of "outdated" Cheetah and Chetak helicopters, which have claimed a number of lives. The government had last August scrapped a Rs 6,000 crore tender for procuring 197 light utility helicopters from foreign vendors for the armed forces and decided to allow domestic players to manufacture these helicopters. This was the third time that this tender was scrapped. The existing fleet of Army Aviation Corps comprises Chetak, Cheetah and Advanced Light Helicopter (ALH). Chetak and Cheetah helicopters were originally manufactured by Aerospatiale, France, and were inducted into service in India in 1969 and 1971, respectively. The helicopters were later indigenously manufactured and delivered by HAL under licensed production since 1977. 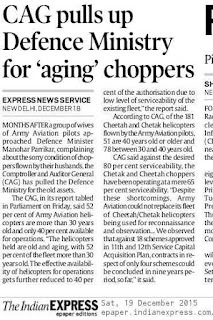 The CAG observed that while the desired level of serviceability of assets in Army Aviation Corps was 80 percent, the overall level of serviceability in respect of R&O (Cheetah/Chetak) Helicopters was only 65 percent on an average. "The position of serviceability in respect of Advanced Light Helicopter was more critical at an average of 44 percent only." "The poor serviceability of ALH was despite the fact that the fleet, which was inducted only from 2002 onwards, was relatively new and was designed, developed and manufactured indigenously by HAL," the CAG said. It also rapped the Defence Ministry over shortage of 47 percent in holding of BMP vehicles. 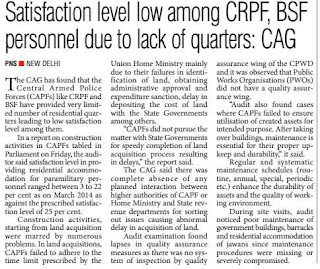 The main reason for the shortfall was the delay in supply of 389 BMPs by OFB, which not only adversely affected the operational preparedness of Mechanised Forces/Engineers but also entailed a minimum extra liability of Rs 270.97 crore due to cost escalation, it said. It also noted that Image Intensifier Sights valued at Rs 22.12 crore for the commanders of T-55 tanks were procured between February, 2011, and June, 2013, after the tank was declared obsolescent in December, 2011. Also, noting that Combat freefall (CFF) parachutes are required during highly-specialised operations and are vital for the success of the missions carried out by Parachutes Special Forces Battalions of Indian Army, CAG said the Army was without these specialised parachutes for over a decade. "The CFF parachutes developed by DRDO in 2006 could not be successfully productionised by the Ordnance Factory Board even after incurring an expenditure of Rs 10.75 crore," it said. The Comptroller and Auditor General (CAG) on Friday said the Indian army was without specialised parachutes for over a decade in a report tabled in Parliament on Friday. It also raised questions on the functioning of army aviation corps, the cantonment boards, and shortfall in the availability of BMP vehicles in the Indian army. “Combat free fall (CFF) parachutes are required during highly specialised operations and are vital for the success of the missions carried out by Parachutes Special Forces Battalions of Indian Army. However, the Army was without these specialised parachutes for over a decade,” the report said. The parachutes developed by DRDO in 2006 could not be successfully produced by the Ordnance Factory Board, even after incurring an expenditure of Rs 10.75 crore, it said. 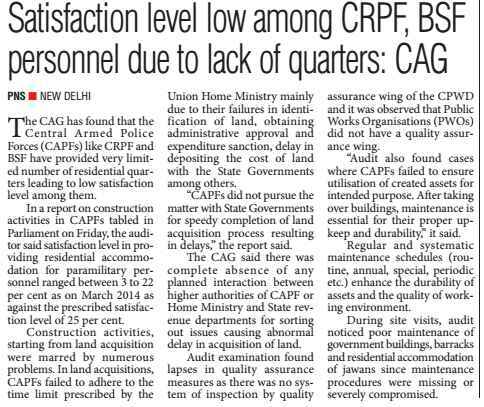 The audit report was also critical of the army aviation corps saying it was plagued with 32%deficiency against its authorised fleet strength. The country’s top auditor, separately, also slammed the Indian Air Force for sub-optimal utilisation of operational capabilities of AWACS (air borne warning and control system) aircraft purchased in 2004 for Rs 5,042 crore and has said shortage of aircrew may impact the operations of the planes during hostilities.